"You unlock this door with the key of imagination." The concept is simple: You're in the Twilight Zone, where things are not as they appear. Classic scenes from the old show make up the different modes. Complete all 14 to open the door to get Lost in The Zone. Battle the Power occasionally on the mini playfield in the upper left. Load the Gumball machine with the Powerball (a special ceramic ball) to get the powerball payoff. 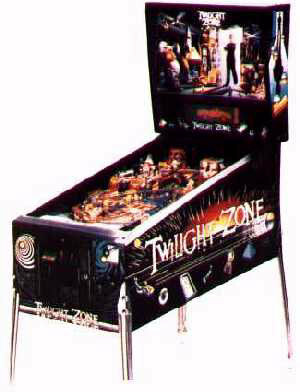 This is game is one of the top collected pinballs due to it difficulty and super cool "Lost in The Zone" mode, where EVERYTHING is lit and you get 6 ball multiball for 1 minute straight (lose a ball during this mode? The machine will fire it back into play for you.). It's very difficult to get, however, as you have to complete 14 modes first.